John Quincy Adams was not a Founding Father, but he was a ‘Founding Son’. Here, William Bodkin continues his series on the presidents of the USA. He looks at a fascinating tale of how John Quincy Adams fought to preserve the Union against “States’ rights” over 50 years after the end of the American Revolutionary War. William's previous pieces have been on George Washington (link here), John Adams (link here), Thomas Jefferson (link here), James Madison (link here), and James Monroe (link here). John Quincy Adams, 1858. Painting by G.P.A. Healy. Even though he was not a member of America’s Founding generation, John Quincy Adams had much in common with the Founders. We can even call him their first son. For example, like his father, John Adams, John Quincy Adams’ time as president was likely his least important contribution to the Republic. 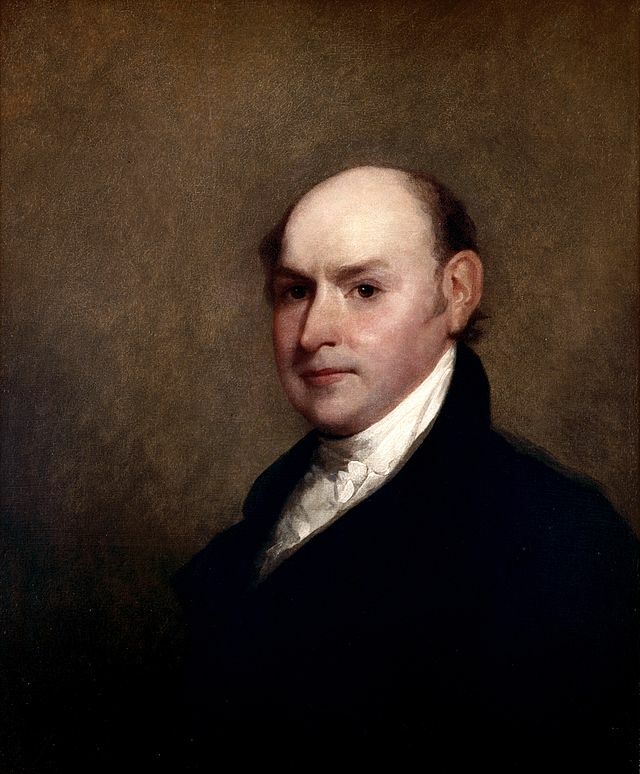 John Quincy Adams’ life was a litany of service to the nation; Ambassador, Senator, Secretary of State, President, and then, finally, Congressman representing his home district in Massachusetts. It was during his time in Congress that the younger Adams secured the esteem that often eluded his family. His debating skills earned him the nickname “The Old Man Eloquent” and he stood, during a time when the American Union was being gradually torn apart by slavery, as a reminder of the importance of unity in the United States. 1839 was a pivotal year in this regard. Adams was nearing the height of his post-presidential influence, which culminated in his 1841 argument of the Amistad case before the Supreme Court, where he helped secure freedom for Africans who had been kidnapped in violation of international law and treaties to be sold as slaves. 1839 helped lay the foundation for the successes to come. In December 1839, a fight for control of the House of Representatives was resolved only when Adams himself agreed to preside over the chamber. Following the 1838 election, two delegations from New Jersey presented themselves in the House, one Democrat (pro-slavery), one Whig (anti-slavery). Control of the House, which was evenly split between the two parties, hinged on which New Jersey faction was seated. In the absence of a Speaker, usually elected by the majority party, the Clerk of the House controlled debate and called for votes. But the Clerk was a Democrat seeking to preserve his party’s rule. He refused to do anything, and would not call votes, even to adjourn. After five days of chaos, Adams, then a Whig, rose and made an impassioned plea directly to his fellow Congressman to override the Clerk, whom he thundered was in defiance of the will of the people and who was holding the whole Congress, ironically enough his employers, in contempt. When someone asked who would “put the question” to a vote since the Clerk refused, Adams, in complete disregard for parliamentary procedure, declared that he would. Stirred by Adams’ speech, a Democratic member who was usually a bitter opponent of Adams, Robert Barnwell Rhett of South Carolina, proposed that the oldest member of Congress serve as temporary Speaker. When he declined, Rhett then rallied Democrats and Whigs alike behind Adams. As the chamber erupted in cheers, Adams was escorted to the dais to preside in the wholly manufactured role of “Chairman of the House of Representatives”, replacing the Clerk. Adams filled the role for nearly two weeks until a compromise candidate for Speaker was settled on. But while in December 1839 Adams was a rallying point for Democrat and Whig alike, in April of that year he used his status as Founding Son and former president to attack one of the Democrats’ favorite arguments supporting slavery, that of “states’ rights” over the federal government. The occasion was an oration Adams delivered at the New York Historical Society celebrating the fiftieth anniversary of the United Stated Constitution. Adams viewed “states’ rights” as an insult to the principles his father fought for in the Revolution. Adams seized on the opportunity of the “Jubilee of the Constitution” to follow once more in his father’s footsteps. He strove to establish a unified theory of the American Founding, one based on the idea that sovereignty in the United States, i.e., supreme power and authority, rested not in “states’ rights” over the federal government, but in the power of the people over both the states and the federal government, each of which should be looked at warily as potential usurpers of the people’s power. Rebirth was needed, and it came, according to Adams, in the form of the new Constitution, with George Washington at its head. Adams asserted that the Constitution was the perfect “complement” to the Declaration of Independence, as they were based on the same principles. Adams believed that the Declaration and the Constitution were “parts of one consistent whole, founded upon one and the same theory of government.” The theory was that the “people were the only legitimate source of power” and that “all just powers of government were derived from the consent of the governed” and not the consent of the states. In Adams’ formulation, “We, the People” of the American Union had again come together, as surely as they had to throw off the despotic rule of George III, to throw off the Articles of Confederation. Adams derided states’ rights as “grossly immoral,” and the “dishonest doctrine of despotic stare sovereignty.” Those who advanced it were advocating a theory of government that stood in direct opposition to the principles of the Founding Era. John Quincy Adams took this fight personally. It had been the life’s work of his family for two generations. As history tells us, however, the lawyerly arguments of John Quincy Adams did not carry the day. It took the near apocalyptic bloodshed of the Civil War to preserve the Union. And even that did not end the debate over the idea that states’ rights were superior to the federal government. The argument continues to this day, with various “popular” movements making the case for states’ rights and secession from the Union. Governors from various states have asserted that their state can handle any American issue better than the federal government, from containing Ebola, to immigration, to health care. But there seems to be one key difference between John Quincy Adams’ era and the present day, and that is in the apparent unwillingness of any major public figure to make the case for Union, and why the American Republic, for all its flaws, remains better, stronger, and more free together than it ever could broken into its constituent parts. Indeed, there seems to be no one to argue on behalf of all the American people why the more perfect union they established must endure. 4. “The Jubilee of the Constitution. A discourse delivered at the request of the New York Historical Society in the City of New York on Tuesday the 30th of April 1839, being the fiftieth anniversary of the inauguration of George Washington as President of the United States, on Thursday, the 30th of April, 1789” by John Quincy Adams, Published by Samuel Colman, Astor House, 1839. (“Jubilee”). 6. See, e.g., Ellis, Joseph, “American Summer,” Chapter 1, “Prudence Dictates” (Knopf 2013).